Be the first to share your favorite memory, photo or story of Marcie. This memorial page is dedicated for family, friends and future generations to celebrate the life of their loved one. 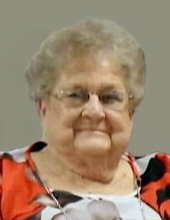 Funeral services for Marcie Bradley Stroud, 86 of Kershaw, will be held at 11:00 o’clock a.m., Friday, February 1, 2019, in the sanctuary of Flat Creek Baptist Church. The Revs. Bart Miles and Bobby Joyner will officiate. Burial will follow in the Mt. Pisgah Baptist Church Cemetery, Jefferson. Mrs. Stroud, loving wife of 68 years to Charles Ray Stroud died Tuesday, January 29, in Springs Memorial Hospital, Lancaster. Born in Kershaw, she was a daughter of the late William Edward Bradley and Mary Emma Catoe Bradley. She retired from Springs Industries after 15 years of service and later retired from Gardner’s Produce after 19 years of service. Marcie was a faithful member of Flat Creek Baptist Church. She loved to spend time with her family and was a member of Kershaw Senior Citizens. She also was an avid reader. She enjoyed reading the bible, the Baptist Courier and all types of magazines. Surviving are her husband of the home; 2 daughters, Karen Bowers and her husband Jacky of Lugoff, Tammy Croxton and her husband Mark of Kershaw; 4 grandchildren, Sammy (Vonda) Bowers, Josh Stroud, Bailey (Kristen) Stroud and Dylan Croxton; 7 great grandchildren, Brandon Bowers, Jase Bowers, Colby Stroud, Mason Stroud and Dylan, Bryce and Rance Rabon and 2 sisters, Doris Gardner of Lexington and Joyce (Connie) Payne of Camden. She was preceded in death in addition to her parents by 2 sons, Larry Marshall Stroud, Danny Ray Stroud and 2 sisters, Mary Myrtle Ogburn and Audrey Sue Joyner. The family will receive friends, Thursday, January 31, from 6:00 to 7:00 o’clock p.m. at Baker Funeral Home and other times at the home. Memorial contributions in memory of Mrs. Stroud may be made to Flat Creek Baptist Church, 3737 Victory Road, Kershaw, SC 29067 or Mt. Pisgah Baptist Church, 2140 McBee Highway, Jefferson, SC 29718. Baker Funeral Home is serving the Stroud family. To plant a tree in memory of Marcie Bradley Stroud, please visit our Tribute Store. "Email Address" would like to share the life celebration of Marcie Bradley Stroud. Click on the "link" to go to share a favorite memory or leave a condolence message for the family.